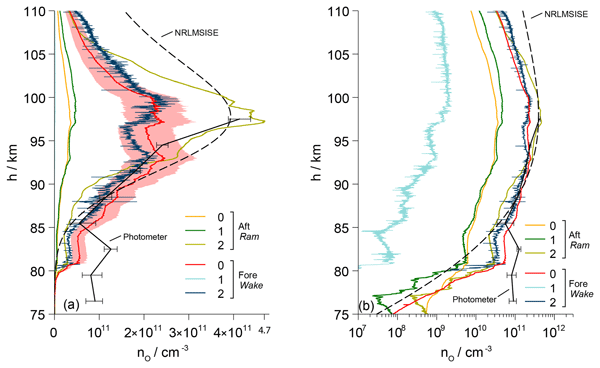 Results from global models are used to analyze the impact of energetic particle precipitation on the middle atmosphere (10–80 km). 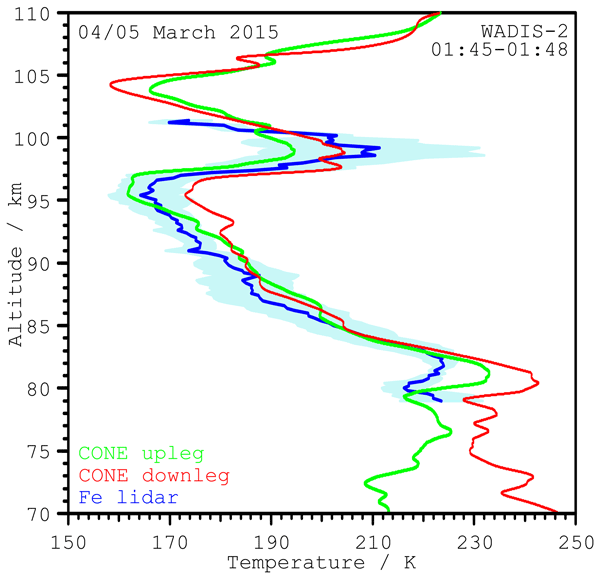 Model results agree well with observations, and show strong enhancements of NOy, long-lasting ozone loss, and a net heating in the uppermost stratosphere (~35–45 km) during polar winter which changes sign in spring. Energetic particle precipitation therefore has the potential to impact atmospheric dynamics, starting from a warmer winter-time upper stratosphere. 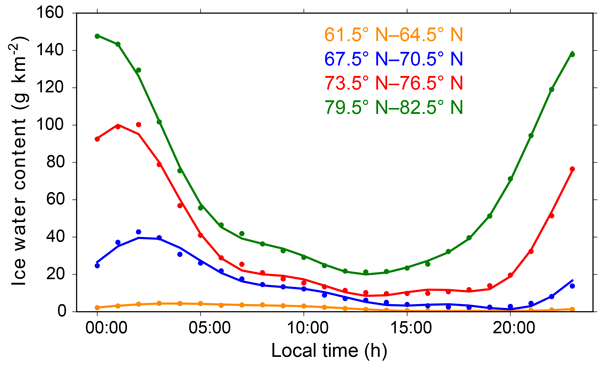 Wind information throughout the middle-atmosphere is crucial for the understanding of atmospheric dynamics but became available only recently, thanks to developments in remote sensing and modelling approaches. We present the first thorough assessment of the quality of the wind estimates by comparing co-located observations from lidar and microwave radiometry and opposing them to the major atmospheric models. Moreover we evaluated a new approach for measuring mesopause region wind by radiometry. We present altitude profiles of winds and temperatures in the Arctic strato- and mesosphere obtained during three Januaries. The data show large year-to-year variations. We compare the observations to model data. For monthly mean profiles we find good agreement below 55 km altitude but also differences of up to 20 K and 20 m s-1 above. The fluctuations during single nights indicate gravity waves. The kinetic energy of such waves is typically 5 to 10 times larger than their potential energy. This work sheds new light on the size distribution of dust grains of meteoric origin in the mesosphere and lower thermosphere region using rocket-borne instrumentation. We found that a large number of very small (~ 0.5 nm) particles are charged and therefore have a significant influence on the charge balance of the lower ionosphere. Wave breaking is studied with a combination of high-resolution turbulence observations with the balloon-borne instrument LITOS and mesoscale simulations with the WRF model. 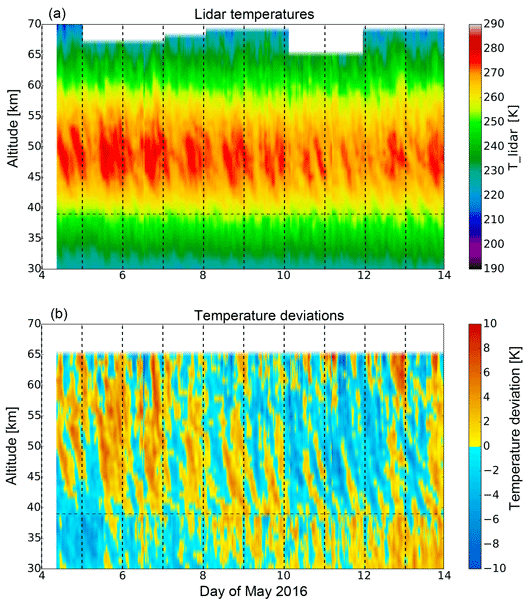 A relation between observed turbulent energy dissipation rates and the occurrence of wave patterns in modelled vertical winds is found, which is interpreted as the effect of wave saturation. The change of stability plays less of a role for mean dissipation for the flights examined. 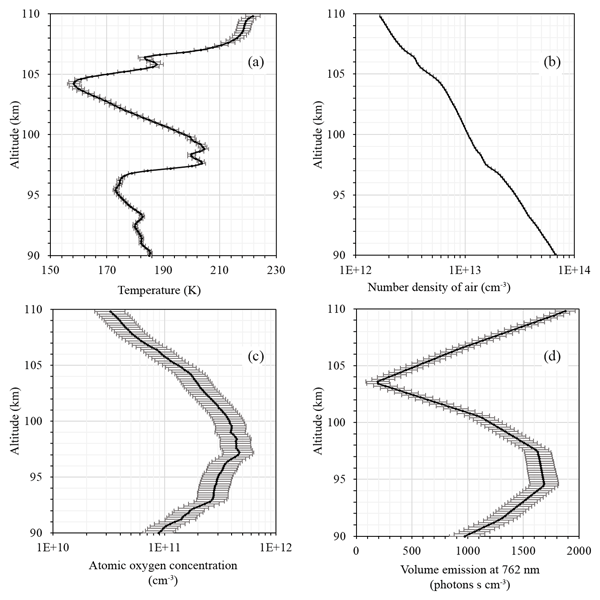 Observed versus simulated mountain waves over Scandinavia – improvement of vertical winds, energy and momentum fluxes by enhanced model resolution? Wind measurements in the middle atmosphere (MA) are crucial to our understanding of atmospheric processes. We have recently developed a new laser-based method to measure winds called DoRIS (Doppler Rayleigh Iodine Spectrometer) which is the only technique to monitor winds in the middle atmosphere quasi-continuously. We compare our measurements with rocket-borne measurements and find excellent agreement above 30 km. 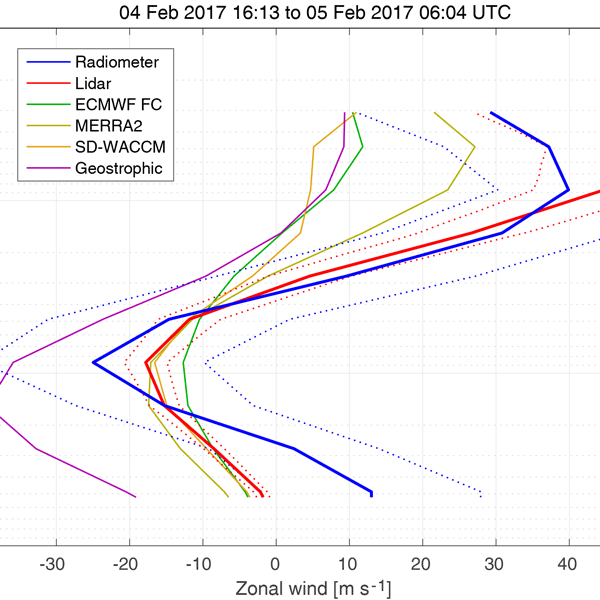 DoRIS can now be considered as a validated method to measure winds in the MA. Temperature soundings by lidar are an important tool for the understanding of the middle atmosphere, including gravity waves and tides. Though, mesospheric lidar soundings at daytime are rare. We describe a daylight-capable RMR lidar with optical bandwidths in the range of the Doppler broadened laser backscatter. 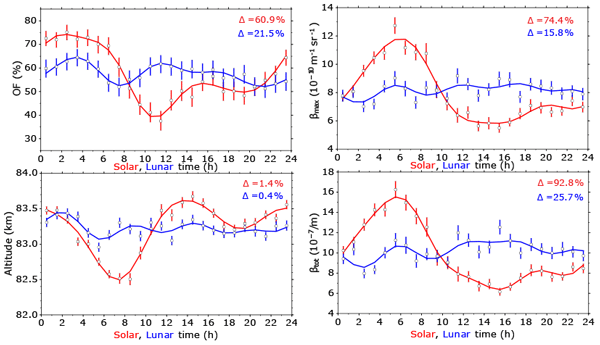 We account for the systematic temperature error induced by the optical filter, and present examples of daylight-independent temperature sounding as well as tidal analysis. Stratospheric turbulence is essential for the atmospheric energy budget. We compare in situ observations with our LITOS method based on spectral analysis of mm-scale wind fluctuations with the Thorpe method applied to standard radiosondes. Energy dissipations rates from both methods differ by up to 3 orders of magnitude. Nevertheless, mean values are in good agreement. 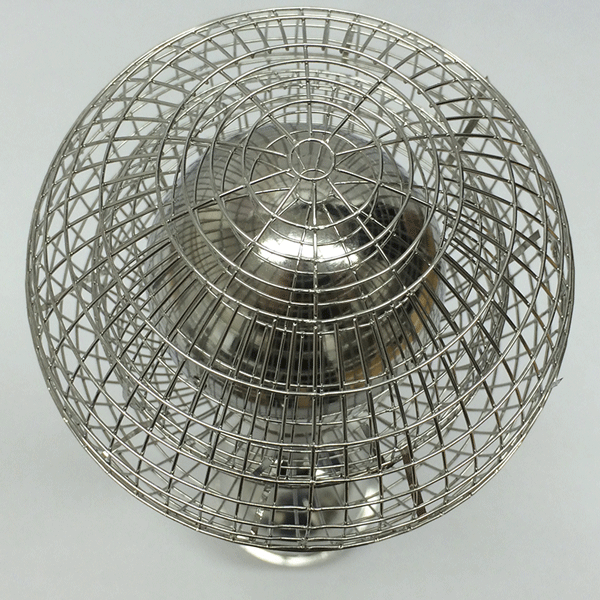 We present case studies on both methods and examine the applicability of the Thorpe method for calculation of dissipation rates. Noctilucent clouds (NLCs) are ice clouds that form at the polar summer mesopause and are very sensitive to temperature. They may therefore provide a way to monitor this remote region as our atmosphere changes. 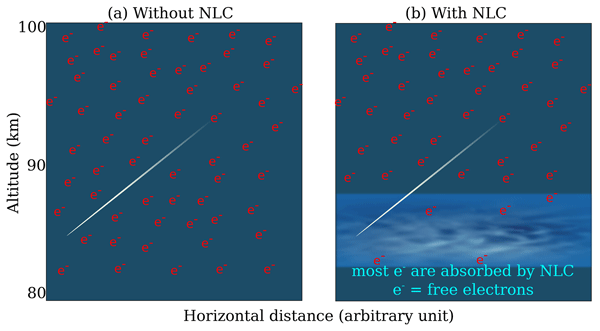 We show that temperature variations in the mesosphere are crucial for the growth of ice particles and that average fields are not enough to describe the process of NLC development. The paper also emphasises the difficulties in retrieving ice particle properties from optical observations.